If you don’t have the room, time, or inclination to maintain a vegetable plot you can still grow your own potatoes as long as you have room for a few planters as in the picture above. You won’t save much, if any, money but your own potatoes will be a treat unimaginable to anyone who has never tasted a potato harvested about 30 minutes before being eaten. I first grew mine in old coal sacks, two or three, one inside the other, to keep the light out. I didn’t bother washing them and the plants don’t mind a bit of coal dust in their soil. When I was preparing for my second planting, I bought the two purpose made bags on the right above. These are bit more spacious, a bit sturdier, and have flaps you can open at the bottom to rob the potatoes out by. To be honest, unless these are really cheap I wouldn’t bother with them as getting at the potatoes from the top is not that hard or messy. 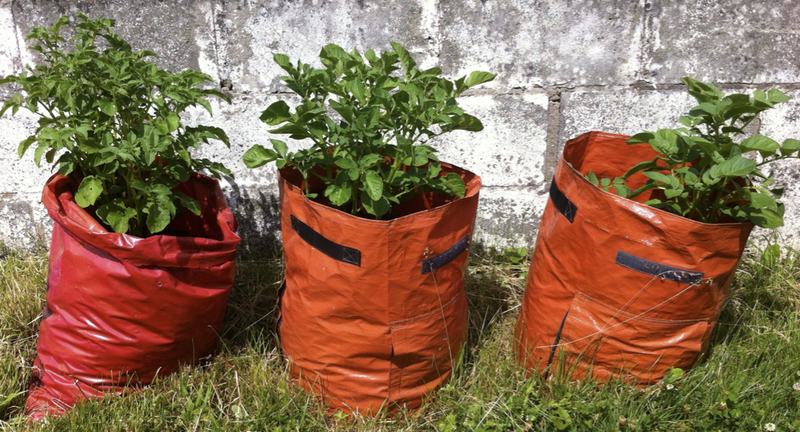 Start off with coal bags if you can, just make a few drain holes about 1” above the bottom to stop the plants getting trench foot or similar from too much rain or watering. Choose the potatoes you want to grow, if you want an early start and the ones you like are not in season yet, buy seed potatoes, otherwise I wait until we have some really nice potatoes from the grocer’s or supermarket, and set some aside. You’ll need two or three for each planter. Chitting – place your chosen potatoes in a dry tray and put on a warm window sill until you have shoots around 1” long. This may take as little as a week, or as long as three in my experience. Prepare the planter – a layer of soil 6” deep in the bottom is ideal. If you have some garden soil or compost already you can use that but I am always a bit circumspect about what I am introducing in the way of mites, creepy-crawlies and other such so I buy some cheap grow-bags or seed and cutting compost, whatever is on offer at the time, and use that. Place the chitted potatoes in the soil in the planters with the shoots upwards, and cover with about 1” of soil. Water well and check every day or two, don’t let the soil get too dry. When they have grown to about 6” tall, cover them up except the top 1” with soil. Keep watering regularly, they’re quite thirsty. Repeat as above every time they are about 6” tall. When the bag is full, keep up the watering until the flowers come. (Mine get a watering can each per day at present). Once the plants have flowered you can start harvesting, just taking enough for immediate consumption. Keep watering. When you have no more potatoes left, compost the plants and use the soil for other purposes. If there will be time for another crop you could re-use the soil. I’ve never kept the same soil from year to year as I always have some other use for it, and I expect it wouldn’t be wise to re-use it for potatoes anyway as it may harbour pests and diseases and be too depleted of nutrients to work well in a year’s time.